This is a super quick little project that requires minimal amounts of both yarn and time! Round 2: Ch 2, *Working in FLO*, (dc, tr) in same st as ch 2, (tr, dc) in next st, (hdc, sc) in next st, sc in next st, ch 2, sl st in 2nd ch from hook (*See photos above), sc in next st, (sc, hdc) in next st, (dc, tr) in next st, (tr, dc) in next st, ch 2. Remove yarn from hook. Insert hook from back to front through joining st from Round 1. Put yarn back on hook and pull thru to the back of the heart (*See photos below). – 14 sts Fasten off. Weave in ends. Round 4: Ch 2, *Working in Both Loops*, dc in same st as ch 2, 2 tr in next 2 sts, 2 dc in next st, 2 hdc in next st, sc in next 3 sts, ch 2, sl st in 2nd ch from hook, sc in next 3 sts, 2 hdc in next st, 2 dc in next st, 2 tr in next 2 sts, dc in next st, ch 2. 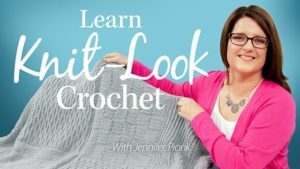 Remove yarn from hook. Insert hook from back to front thru joining st from Round 3. 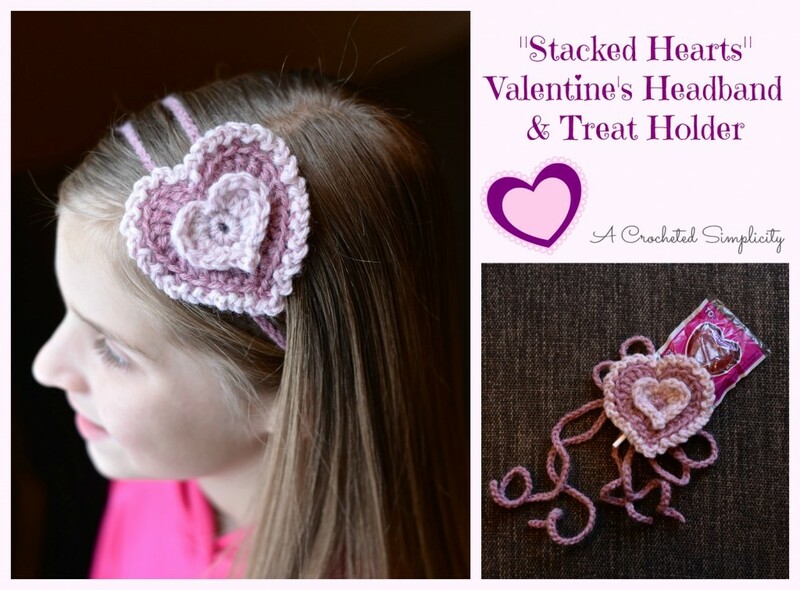 Put yarn back on hook and pull through to the back of the heart (*See photos below). – 24 sts + 3 ch-2 Fasten off. Weave in ends. Round 5: Join CA w/ a sl st to BLO of 1st ch of Round 4, *ch 2, sl st in BLO of next st, repeat from * around, skipping the BLO of the st at the bottom point of the heart (*See photos below). Fasten off. 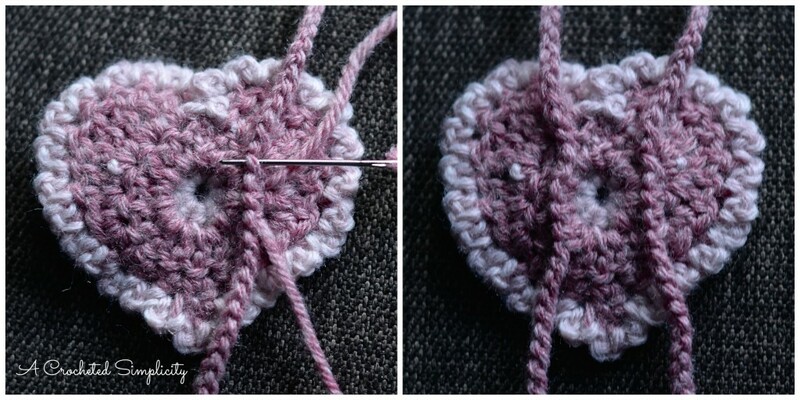 Using a yarn needle, weave the tail of yarn through the BLO of the 1st st of the round (*See 4th photo below). Weave in ends. Ties (Make 2): Using your hook and whichever color yarn you prefer, ch the length of the circumference of the child’s head plus an additional 6-8″ (leaving enough free to tie). Claire’s head is 20″ so I chained ties that were 28″ long. Attaching the Ties to the Heart: Fold your ties in half to find the center then position the heart 2-3″ from the center with the tip of the heart pointing towards the short ends of the ties. 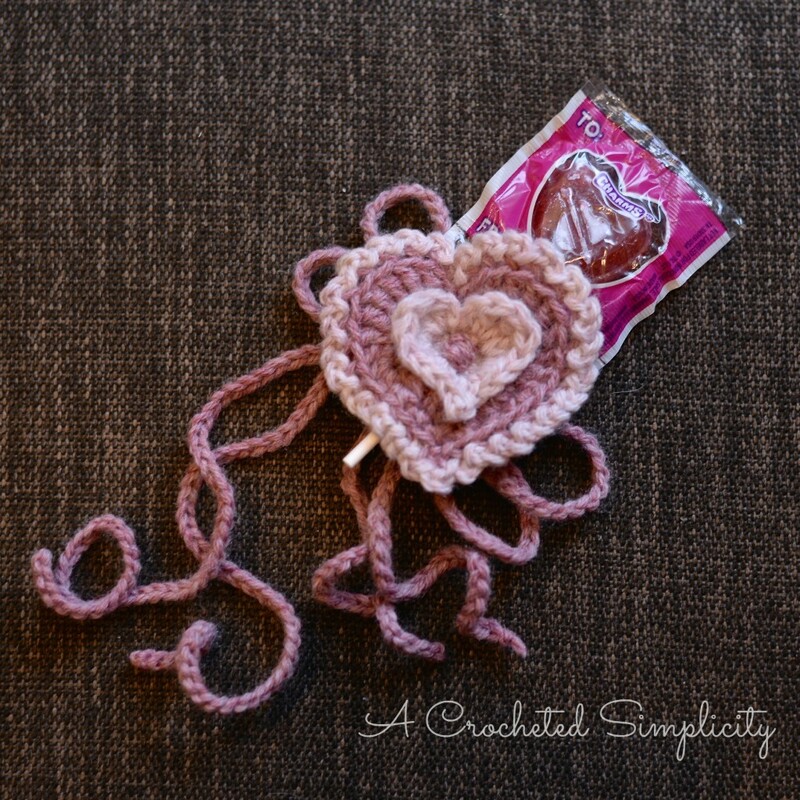 Using a yarn needle and scrap of yarn, sew the ties onto the back of the heart as shown above. I laid my ties so that the back hump of the chain was facing up. Sew through at least 6 chs of each tie (*See photos above). 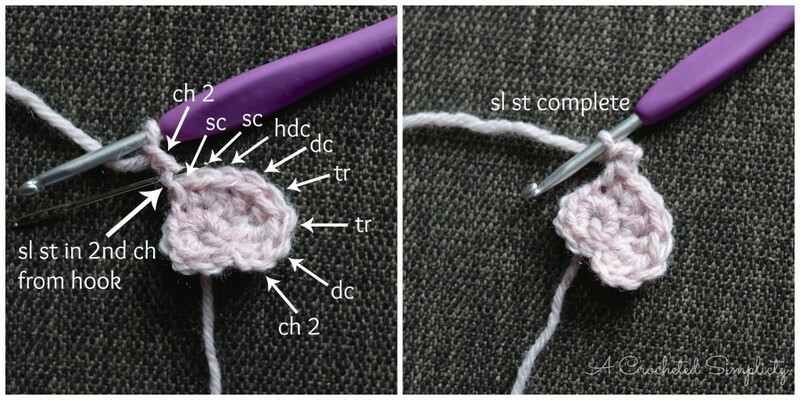 Using your crochet hook, pull up a loop of two (of the 4) tie ends. Pull up a loop only, do not pull the ends all the way through to the front. Insert the sucker stick, from back to front, through a stitch from Round 1. Insert the sucker stick thru the loops of the ties and then finally, insert them through another st from Round 1 that is opposite the one you came up through. Pull the loose ends of the ties to tighten the loops and secure the sucker stick. Flip the headband over to the back and tie the ends in a bow.